A chain-reaction crash over a North Texas lake involving as many as 15 vehicles left Interstate 30 over Lake Ray Hubbard closed most of Friday. Texas Department of Transportation officials said multiple vehicles were involved in the crash on the I-30 bridge over the lake, prompting the closure of both directions of the highway at Dalrock Road. The bridge was closed for about 17 hours until TxDOT officially reopened the bridge at about 8 p.m. on Friday. At about 2:30 p.m., the westbound lanes remained closed to traffic while some drivers are being allowed to pass on the eastbound side. About 4:30 p.m., a third lane going eastbound was opened to traffic. Police said trucks and other vehicles blinded by fog likely collided with a vehicle that hit the concrete median and eventually caused the pileup. Police reports found by the Dallas Morning News indicated 23-year-old Christopher Anthony Sosa was charged with intoxication assault after he too was involved in the crash. Police told NBC 5's Ken Kalthoff that Sosa's vehicle was not the first involved in the crash. At the scene before dawn Friday, NBC 5's Jeff Smith observed six semi trucks with front-end damage. Tony Hartzel, with TxDOT, said those trucks will require specialized wreckers to remove them from roadways. Some of those trucks carrying heavy loads may need to be unloaded before emergency crews can remove them. Dallas Fire-Rescue's Jason Evans said the damage to vehicles was severe enough to require a Hazmat response to clean up vehicle fluids, including oil and fuel, from the roadway. Officials said eight people were injured in the crash, most of whom suffered minor, non life-threatening injuries in the crashes. One person remains in intensive car Saturday at Baylor Medical Center in Dallas. TxDOT officials said around 500 feet of concrete barrier in the median of the lanes was damaged in the crash and will need to be repaired. 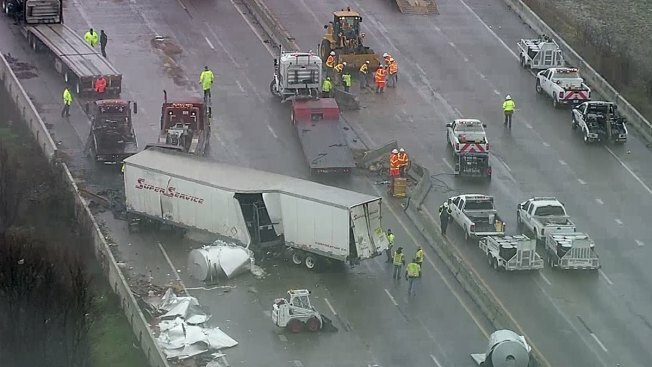 Dallas police said that while several lanes in each direction will reopen Friday afternoon, the lanes in each direction closest to the concrete median could remain shut down for several days due to repairs. A time line for repairs has not been confirmed, though the center lanes may be closed for several days while the barrier walls are replaced. While officials have not revealed the cause of the crash, dense fog in the area is believed to have played a role. Drivers across North Texas should use caution Friday, as The National Weather Service has extended a dense fog advisory for the Dallas area through 9 a.m. Friday. NBC 5's Jeff Smith and Ben Russell contributed to this report.